It measures 4.5” long X 2.25” wide X 5/8” thick. Built in super bright LED flash light. Master switch and extra safety switch to prevent accidental discharge. It comes with a holster to keep it. The rubberized curved and contoured finger grips design fits right in your palm, which gives more control and ease to the taser gun. Prongs are on the tips for easy access. Taser Stun and Light magnet buttons are on opposite sides with master On-Off switch to eliminate misfires. Built in super bright LED flash light. Rechargeable, plugs directly into standard wall outlet (No cord needed). Includes synthetic leather holster with belt loop for easy carrying. 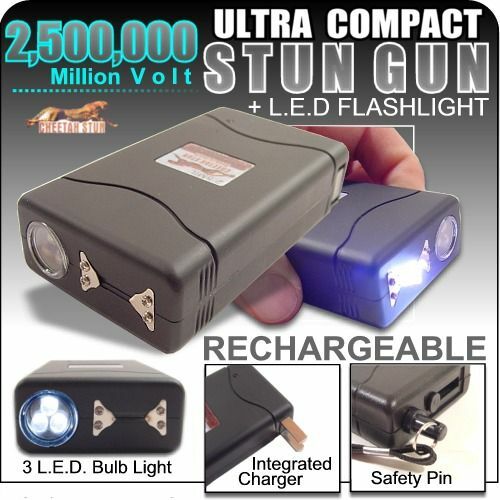 Cheetah Jogger Stun ™ 4.8 Million Volts Rechargeable Stun Gun. It is perfect for joggers and walkers to keep in hand. User has an option to hammer strike with the pointed spikes or fist punch with powerful taser gun for self defense. It comes with a synthetic leather holster with belt clip to carry. This is the latest and strongest taser gun available in market. Comes ready with strong LED Flashlight . 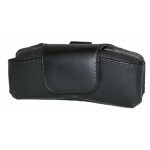 Includes clip on leather case and rubberized coating for easy belt access. On-Off Master Safety Switch. Blaster Trigger Button. 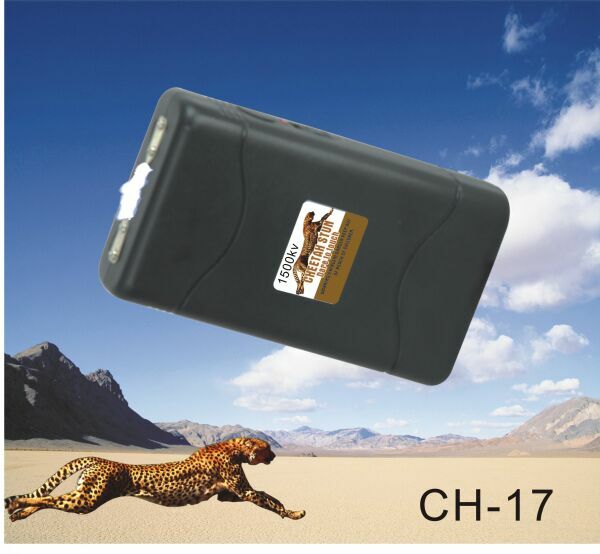 CH-43 Cheetah Nitro 2.5 Millions Volts Rechargeable Stun Gun With LED Flashlight. It is small but strong enough to scare the attackers. Built in LED Bright Flash Light. Rubberized exterior coating, Rechargeable, slide out plugs directly into standard wall outlet (No cord needed). Optional Key Chain included along with matching color synthetic leather holster with purse clip and key chain ring. DUO Mini Rechargeable Stun Gun with Patent Pending Duo Shock Technology. It is small but powerful enough to stop any attacker. Double prongs for DOUBLE POWER. Safety strap pin and separate pin are included which Disables STUN GUN when pulled out. Safety Pin for Cheetah Stun Guns Models. This is a replacement safety pin for most of the Cheetah Stun Guns models. You can get your replacement safety pin now and keep your Stun Gun. This is our latest Lipstick Stun gun. This product is one of its kind becuase of its size and design. It comes in 2.5 Million Volts with a Taser LED flashlight. Also this is rechargable so no need to worry about dead batteries. Comes in Black and Pink colors. This is our latest innovation in Self Defense products. 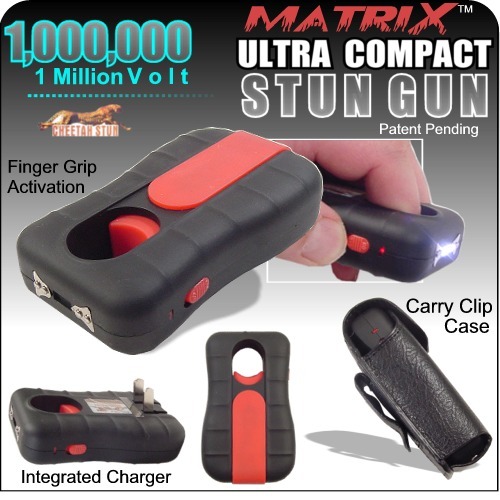 Matrix™ Tazer Stun is one of its kind with patent pending design. This is perfect for everyday users to protect themselves. Very small and compact. This is the latest and strongest taser stun gun available in market. Comes ready with strong LED Flashlight . Include clip on leather case and rubberized coating for easy belt access. Safety pin is included with the tazer stungun. Rechargable battery, Just plug it into the power outlet to recharge. Ultra Bright LED Flashlight. On-Off Master Safety Switch. Blaster Trigger Button. Free Leather Holster with belt loop. Built-In Rechargeable NiCad Battery. Plug-In Power Charger Cord. And Built-In Charger. Frightening One Million Volts. The blast is so loud, the 1,000,000 volt model is even more effective in scaring off an bad guy without actually using the stun feature. Simply slide the safety switch on, press the blast button and hear the very frightening 1 Million volt snap. The attacker will know it's a real high power tazer gun and should run or surrender. Never Needs Batteries. Built-in rechargeable lithium batteries and built-in charger. Plug into the wall to recharge. 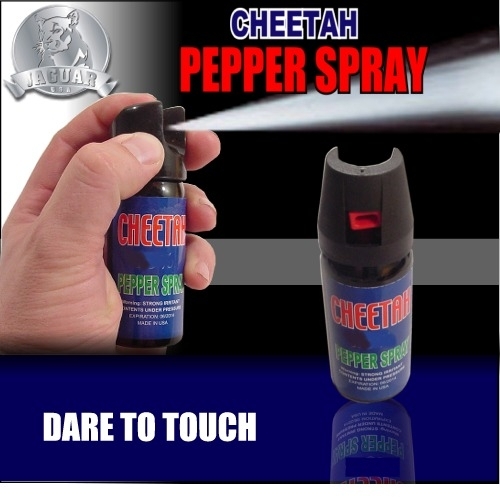 This is our latest model of Cheetah stun guns with 1.5 Million volts. This is true power of the Famous Cheetah StunGuns. 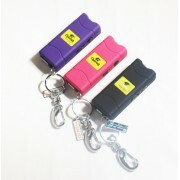 This Stun Gun is rechargeable with a FREE saftey pin included. 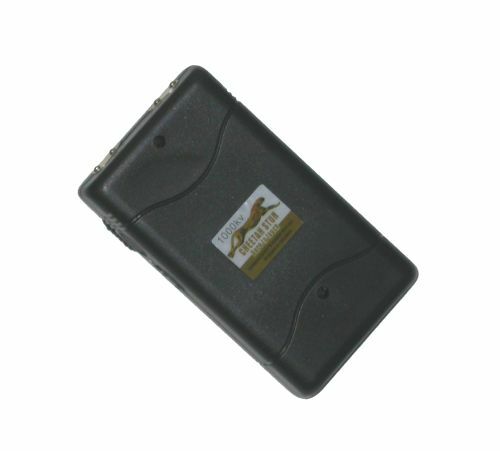 Cheetah Stun Gun with rechargeable battery and FREE saftey pin. Free holster included with belt loop. World's Strongest Mini Stun Gun. Just test firing this stun gun into the air is often enough to stop an attacker. As the bright electric current pulsates between the test nodes and creates a strong electrical sound, any attacker will stop in his tracks. If the sound doesn't stop them, this rechargeable mini stun gun will. 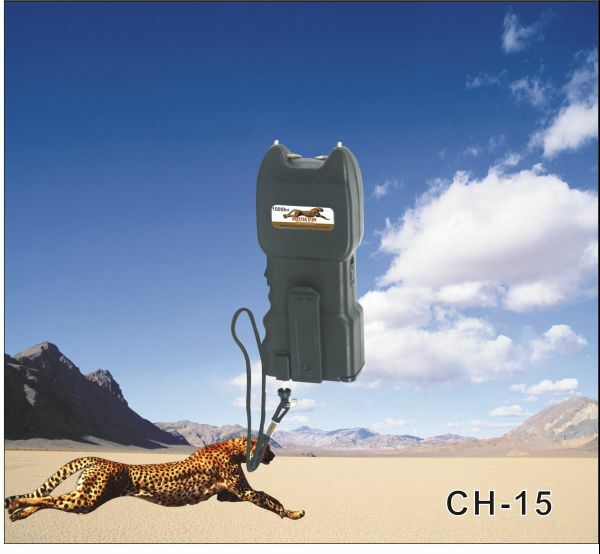 When an attacker is touched by the very powerful rechargeable cheetah mini stungun, it will stop anyone.. 3 to 5 seconds will deliver a high voltage shock causing loss of balance, confusion, and disorientation bringing the them to their knees. Full recovery takes about five to ten minutes and there is no permanent harm. No batteries needed, just plug it to the wall outlet to recharge. The ground breaking design of the CHEETAH Stun Gun enables 1,000,000 volts to fire out of a stun gun that is so small it can actually be concealed inside a pack of cigarettes. Traditionally, the higher the voltage of a stun gun the larger the unit had to be. This is because they are normally powered by 9 volt batteries and the higher voltage units required three or four batteries. Ultra Bright LED Flashlight. On-Off Master Safety Switch. Free Leather Holster with belt loop. Built-In Rechargeable NiCad Battery. Plug-In Power Charger Cord.And Built-In Charger. Frightening 950,000 Volts of power. The blast is so loud, the 950k volt model is even more effective in scaring off an bad guy without actually using the stun feature. Simply slide the safety switch on, press the blast button and hear the very frightening 950,000 volts. The attacker will know it's a real, high power stun gun and they are sure to surrender. Built-in rechargeable lithium batteries and built-in charger. Plug into the wall. On-Off Master Safety Switch. Built-In Alarm and safety pin. Free Holster with belt loop. Blaster Trigger Button. Frightening 1,000,000 Volts of power. The blast is so loud, the 950k volt model is even more effective in scaring off an bad guy without actually using the stun feature. Simply slide the safety switch on, press the blast button and hear the very frightening One Million volts. The attacker will know it's a real, high power stun gun and they are sure to surrender. 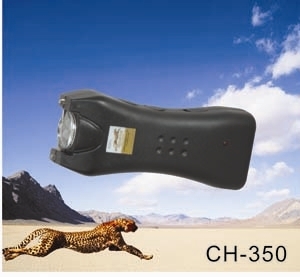 Cheetah 350,000 Volts Stun gun. Built In Flash Light & Rechargeable Battery. FREE Belt Holster Included. On-Off Master Safety Switch. Blaster Trigger Button. Flashlight Button. **You can follow us on Facebook, Twitter. Our inventory is available at Ebay and Amazon for your convenience.